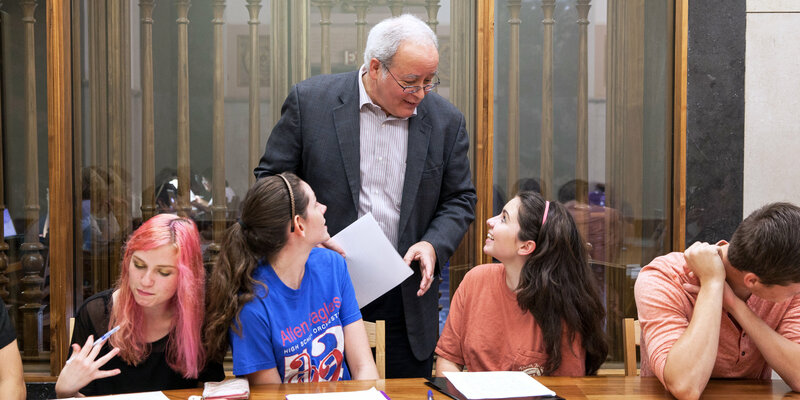 The Signature Course (UGS 302 and 303) introduces first-year students to the university’s academic community through the exploration of new interests. The Signature Course is your opportunity to engage in college-level thinking and learning. We design a variety of courses by matching student interests with faculty expertise from every college and school at the university. The result is a common intellectual experience for all first-year students. Delve into stories about our groundbreaking Signature Courses. Or take a quick look at our latest newsletter, which showcases outstanding Signature Courses, profiles faculty and TAs, and provides information about upcoming events. Don’t feel restricted by your major or college when choosing your course. This is a great opportunity to explore, and many concepts in the Signature Course, for example, the emphasis on writing and public speaking, will be useful whichever major you declare. If you plan to major in business, take “Geosciences in the Media”. Prospective anthropology major? Try “Astronomy and the Humanities”. Want to be an engineer? You’ll love the “Psychology of Music”. Undecided? You have over 220 course offerings to choose from. Whatever Signature Course you select, you will share an experience with students from across the university. Cross disciplinary boundaries, explore important societal issues, and learn about the vast resources that make UT a world-class center of learning and creativity: start here, change your world.